The Nikon Nikon D3100 DSLR Camera with 18-55mm f/3.5-5.6 Auto Focus-S Nikkor Zoom Lens has been discontinued by Nikon, though it is currently still available. Despite the availability of a variety of DSLR manufacturers, the Canon versus Nikon debate is still going strong. Since the days of 35mm film, the two manufacturers have been close competitors. Traditionally, things seem to see-saw between the two, with each manufacturer becoming stronger for a while, before fading away to the other. If you're not tied into a system, the choice of cameras can seem bewildering. In this article, we're going to take a look at the two manufacturer's entry-level cameras — the Canon T3 and the Nikon D3100. Which is the better buy? We'll take a look at the key points on each camera to help you make a more informed decision. 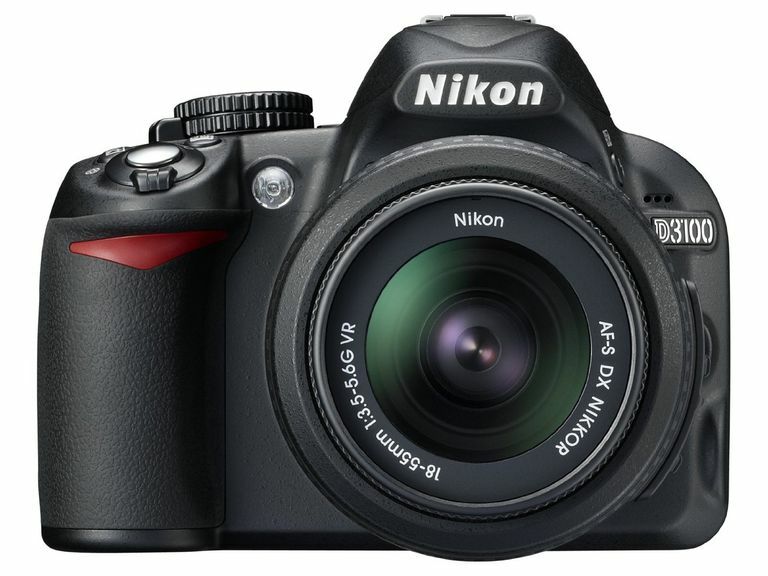 The Nikon D3100 is the winner in the resolution stakes, with 14MP compared to the Canon's 12MP. In actual terms, though, it's only a slight gap, and you're unlikely to notice much difference between the two. Both cameras are made out of plastic, with the Nikon weighing slightly more than the Canon T3. However, the Nikon is slightly more compact in size. The Nikon D3100 definitely feels more substantial in the hand. Neither camera is perfect when it comes to controls. However, the Canon T3 does at least have direct access to ISO and white balance on the four-way controller at the back of the camera. With the T3, though, Canon has moved the ISO button next to the mode dial, away from its usual position on the top of cameras. We really can't understand why Canon has chosen to do this, as it means that ISO can't be changed without moving the camera away from the eye. The T3 does benefit, however, from the addition of the "Q" button, which allows for quick access to the Rear Control Screen (appearing on the LCD screen), and fast changing of most shooting parameters. The Nikon D3100, in comparison, has no direct access to ISO or white balance. You can assign one of these functions to the Customizable Function button at the front of the camera, but it's only one button, unfortunately. The included buttons are nicely laid-out, but maybe that's just because so many obvious ones are missing. Both cameras come with features designed to help first-time DSLR users. The Canon T3 has the combination of its "Basic+" and "Creative Auto" modes, which allow users to do things such as controlling the aperture (without having to work through technical terms) or choosing the lighting type (setting white balance). It's a useful feature, but it's not done as well as Nikon's Guide Mode. With Guide Mode, when the D3100 is used in "Easy Operation" mode, the user can have the camera choose the required setting for different situations, such as "Sleeping Faces" or "Distant Subjects." As the users grow more confident, they can progress to the "Advanced" mode, which guides users toward either the "Aperture Priority" or "Shutter Priority" modes. Both are accompanied by a simplified interface that uses the LCD screen to show the projected results when changing these settings. The D3100's system is extremely well thought out, and it is far more advanced than Canon's offering. The T3 has nine AF points, whereas the D3100 comes with 11 AF points. Both cameras are fast and accurate in normal point and shoot mode, but both slow down in Live View and Movie Mode. The Canon model is particularly bad, and it's almost impossible to use it at all on autofocus in Live Mode. However, a problem with the Nikon D3100 is that it doesn't have a built-in AF motor. This means that autofocus will only work with AF-S lenses, which are usually more expensive. Both cameras perform well straight out of the box at their default JPEG settings. Any new user to DSLRs would be happy with the results. The colors on the T3 are perhaps a little more natural than on the D3100, but the Nikon's images are sharper than the Canon's — even at base ISO settings. The Nikon D3100's overall image quality is probably slightly better, particularly in low light conditions and at high ISOs, where it performs exceptionally well for any DSLR, let alone an entry-level one. After it's debut, the Nikon D3100 was a hard camera to beat, and, while the Canon T3 provided close competition, it didn't quite cut it. The D3100 isn't perfect, as we've discussed here, but in terms of image quality and ease of use for beginners, it was pretty unbeatable.